The outdoor 7-a-side competition for primary schools for the Gilmour Shield was played at the KGS Playing Fields on Saturday 4th June. 19 teams including a team from Westray competed in four groups with the top two teams in each group progressing to the quarter finals. After an exciting day of football it was St Andrews who completed a clean sweep of the primary football competitions when St Andrews Dynamos won the Shield with a narrow 1-0 win over Dounby A in the final. The victory followed on from St Andrews Hurricanes success in winning the indoor league and cup competitions during the indoor winter season. The winning goal was scored by Thorfinn Scott from close range in the first half of a close match between two evenly fought sides. St Andrews Twisters 0 Evie 1; Glaitness B 3 Orphir 0; Papdale C 4 Evie 0; St Andrew Twisters 1 Glaitness B 0; Orphir 0 Evie 0; Papdale C 0 Glaitness B 0; St Andrews Twisters 2 Orphir 0. St Andrews Dynamos 2 Stromness 0; Dounby A 3 Hotspurs 1; Stenness 0 St Andrews Dynamos 6; Stromness 0 Dounby A 1; Hotspurs 9 Stenness 0; St Andrews Dynamos 0 Dounby A 0; Stromness 1 Hotspurs 1; Stenness 0 Dounby A 11; St Andrews Dynamos 2 Hotspurs 0; Stromness 7 Stenness 0. Papdale B 7 Terriers 0; Dounby B 0 Papdale D 3; Westray 1 Papdale B 4; Terriers 0 Dounby B 9; Papdale D 4 Westray 0; Papdale B 0 Dounby B 0; Terriers 0 Papdale D 9; Westray 0 Dounby B 7; Papdale B 0 Papdale D 2; Westray 6 Terriers 0. Papdale A 0 St Andrews Hurricanes 4; Firth 0 Glaitness A 1; Glaitness A 4 Papdale A 0; St Andrews Hurricanes 6 Firth 0; Firth 0 Papdale A 1; Glaitness A 1 St Andrews Hurricanes 1. St Andrews Dynamos 1 Dounby A 0. 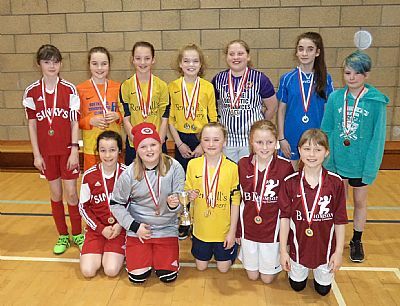 The Primary Indoor Football season came to an end at Picky on Saturday night with the knockout cup competitions played. 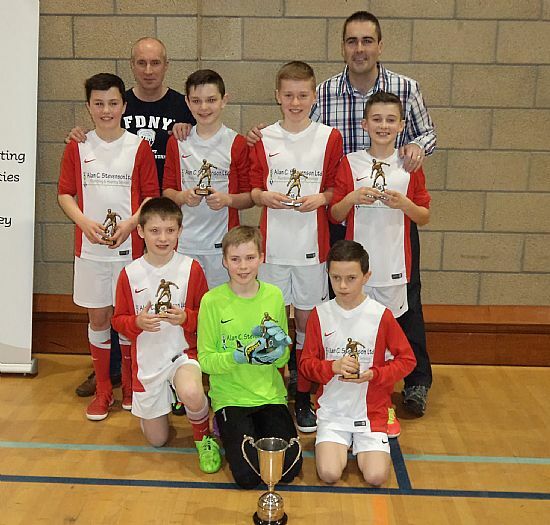 St Andrews Hurricanes completed a league and cup double as they added the TSB Trophy to the league title. It was no surprise that the league winners and runners up made it to the final although Real Dounby were extremely lucky to beat St Andrews Dynamos in the semi-final on penalties after scoring a last second equaliser to earn extra time. The final was a tight match and it was a Christopher Scott goal midway through the match after good lead up play that earned Hurricanes a narrow 1-0 victory over Real and a first victory over the West side after the two league matches between the sides ended goalless. As a result Hurricanes retained the TSB Trophy for the second year in a row and completed the double for the first time since 2009/10. The other main competition of the evening was the Reid Crescent Shield and in a competition where it is always difficult to predict the winner, this year was to be no exception. After two closely fought semi-finals it was two Kirkwall sides Glaitness Rovers and Papdale Vikings that made it through to the final. After Rovers took an early lead it was Vikings who came back strongly scoring an equaliser and a late winner to secure a narrow victory in a close encounter. Goals were hard to come by in the traditional East v West matches played on the final night with only one goal being scored in the three matches played. The one goal came in the A match where West A beat East A by a single goal to win the S R Paterson Shield. There were no goals in the B match with East B winning the Johnny Johnstone Plate 4-3 on penalties after the match ended goalless. A welcome feature of this year’s primary football has been the record number of girls playing with Evie Hammers and Papdale Vikings leading the way with three girls playing for both teams. This resulted in the first ever East v West girls match in the primary indoor football season. It was fitting that honours were shared in a match in which both teams gave their all but neither team was able to break the deadlock in a 0-0 draw. 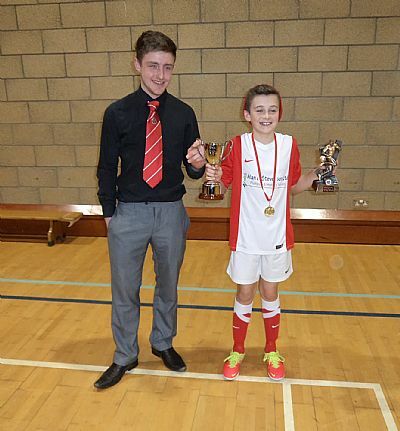 Neve Hall presented the girls with medals and a trophy kindly donated by KT Sports. The presentation of trophies and medals took place at the conclusion of the evening’s play with OYDG Chairman Stephen Crawford commenting on the exciting night of football on the final night. He thanked the schools, coaches, and sponsors who had all contributed to another excellent winter of indoor football with special thanks to the three referees who had refereed the bulk of matches – Jim Leask, Lennie Merriman and Robbie Norquoy who were presented with a gift as a token of thanks. Trophies and medals were then presented on behalf of the various sponsors by Margo Macpherson representing TSB Bank and Justin Maciver representing S R Paterson. Stephen thanked TSB for their long term support for youth football which also included a cheque for over £870 presented by Margo to OYDG on the final night thanks to some marvellous fundraising activities by TSB staff during 2015. The final presentation of the night was for Indoor Player of the Year award. With so many good young players on show it was difficult to finalise a shortlist of five players. In the end it was Archie Atkinson (Real Dounby); Gemma Montgomery (Evie Hammers); Harry Field (Hope Hotspurs); Jamie Barber (Evie Hammers); and Nairn Hall (St Andrews Hurricanes) who were nominated. From the shortlist Nairn was chosen as the top player having had an excellent season for the double winning Hurricanes team. He was presented with the trophy by Joe Wilson who played for Hurricanes the last time they won the league and cup double in 2009/10. 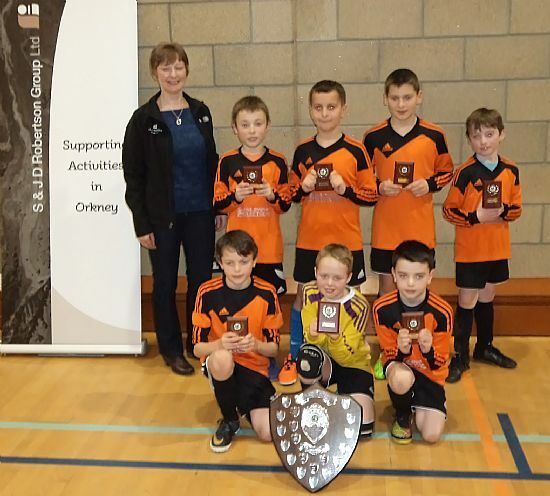 OYDG would like to thank all the trophy and medal sponsors for the cup competitions: - S R Paterson Ltd; Cafelolz@21; Brian Budge; KT Sports, Gordon Wilson and TSB Bank. Quarter Finals: Stromness Predators 0 Papdale Dales 1; St Andrews Hurricanes 3 Papdale Kings 0; St Andrews Dynamos 2 Hope Hotspurs 0; Real Dounby 1 St Andrews Cyclones 0. Final: St Andrews Hurricanes 1 Real Dounby 0. Evie Hammers 2 Papdale Flyers 1. First Round: Papdale Knights 0 St Andrews Twisters 4; Glaitness Swans 0 Stenness/Orphir Falcons 2; Papdale Vikings 1 Stromness Devils 0; Papdale Gladiators 0 Hope Terriers 5; Papdale Mighty Marvels 1 Glaitness Rovers 2; Orphir Torpedos 2 Papdale Giants 1; Athletico Dounby 0 Stromness Strikers 0 a.e.t. Strikers won 4-2 on pens; Firth Scorpions 0 Inter Dounby 1. Quarter Finals: St Andrews Twisters 0 Stenness/Orphir Falcons 0 a.e.t Twisters won 4-2 on pens; Papdale Vikings 3 Hope Terriers 0; Glaitness Rovers 1 Orphir Torpedos 0; Stromness Strikers 0 Inter Dounby 3. Final: Papdale Vikings 2 Glaitness Rovers 0. East B 0 West B 0 a.e.t. East won 4-3 on pens; East Girls 0 West Girls 0; East A 0 West A 1. There were plenty of surprises as the second week of the qualifying competition for the TSB Trophy and Reid Crescent Shield took place at Picky last Saturday night. Of the four seeded teams only St Andrews Hurricanes progressed to the quarter finals of the TSB Trophy as Glaitness United, Papdale Flyers and Evie Hammers failed to make the top two places in their respective groups and drop out of both competitions. In Group 3 it was two Papdale sides Dales and Kings who topped the group as both sides beat Flyers with Dales beating Kings in their final match to ensure qualification. A 1-0 defeat against Papdale Kings cost the other seeded side Evie Hammers dearly. In Group 4 where Hurricanes won all their matches it was Stromness Predators who also progressed following a crucial 1-0 victory over seeded Glaitness United. Papdale Flyers 0 Papdale Kings 2; Evie Hammers 1 Papdale Dales 0; Athletico Dounby 0 Stromness Strikers 1; Papdale Dales 2 Papdale Flyers 1; Stromness Strikers 0 Evie Hammers 3; Hope Terriers 0 Athletico Dounby 2; Evie Hammers 4 Athletico Dounby 0; Papdale Flyers 3 Stromness Strikers 0; Papdale Kings 2 Hope Terriers 0; Athletico Dounby 0 Papdale Dales 4; Hope Terriers 0 Evie Hammers 2; Stromness Strikers 0 Papdale Kings 2; Papdale Dales 1 Stromness Strikers 0; Hope Terriers 0 Papdale Flyers 4; Evie Hammers 0 Papdale Kings 1; Papdale Flyers 2 Evie Hammers 0; Papdale Dales 4 Hope Terriers 0; Papdale Kings 2 Athletico Dounby 0; Hope Terriers 0 Stromness Strikers 0; Papdale Kings 0 Papdale Dales 1; Athletico Dounby 0 Papdale Flyers 1. St Andrews Hurricanes 5 Papdale Mighty Marvels 1; Glaitness United 2 St Andrews Twisters 1; Stromness Predators 4 Papdale Knights 0; St Andrews Twisters 0 St Andrews Hurricanes 3; Papdale Knights 0 Glaitness United 4; Stromness Devils 0 Stromness Predators 3; Glaitness United 0 Stromness Predators 1; St Andrews Hurricanes 4 Papdale Knights 0; Papdale Mighty Marvels 1 Stromness Devils 1; Stromness Predators 4 St Andrews Twisters 0; Stromness Devils 1 Glaitness United 2; Papdale Knights 0 Papdale Mighty Marvels 0; St Andrews Twisters 2 Papdale Knights 0; Stromness Devils 0 St Andrews Hurricanes 4; Glaitness United 4 Papdale Mighty Marvels 0; St Andrews Hurricanes 4 Glaitness United 0; St Andrews Twisters 3 Stromness Devils 1; Papdale Mighty Marvels 0 Stromness Predators 4; Stromness Devils 2 Papdale Knights 0; Papdale Mighty Marvels 0 St Andrews Twisters 2; Stromness Predators 0 St Andrews Hurricanes 2. There was plenty of excitement for the large crowd as the first two qualifying groups in the TSB Trophy were played at Picky on Saturday night. The main surprise was in Group 1 where seeded Glaitness Spurs failed to qualify for the quarter finals and as a result drop out of this year’s cup competitions. Dropped points in a draw against Papdale Vikings and a defeat to St Andrews Cyclones were to cost Spurs dearly. It was Cyclones who took full advantage and this peedie St Andrews team who have entertained the Picky crowd over the winter months with their skill and enthusiasm deservedly qualified for the quarter finals. Group 2 went to form with both seeded teams Real Dounby and Hope Hotspurs progressing, It was a close run thing for Hotspurs however as they ended up level on points with Inter Dounby and only went through as a result of beating the Dounby side 2-1 in the match between the teams. Real Dounby 3 Firth Scorpions 0; Hope Hotspurs 2 Inter Dounby 1; Papdale Gladiators 0 Glaitness Rovers 2; Inter Dounby 0 Real Dounby 3; Glaitness Rovers 0 Hope Hotspurs 1; Papdale Giants 4 Papdale Gladiators 0; Hope Hotspurs 4 Papdale Gladiators 0; Real Dounby 3 Glaitness Rovers 0; Firth Scorpions 2 Papdale Giants 0; Papdale Gladiators 0 Inter Dounby 4; Papdale Giants 0 Hope Hotspurs 2; Glaitness Rovers 0 Firth Scorpions 0; Inter Dounby 1 Glaitness Rovers 0; Papdale Giants 0 Real Dounby 4; Hope Hotspurs 0 Firth Scorpions 1; Real Dounby 1 Hope Hotspurs 0; Inter Dounby 4 Papdale Giants 0; Firth Scorpions 4 Papdale Gladiators 0; Papdale Giants 0 Glaitness Rovers 4; Firth Scorpions 0 Inter Dounby 3; Papdale Gladiators 0 Real Dounby 4. The TSB Trophy starts on Saturday with 28 primary teams competing. The format for the competition sees teams split into groups of four with Groups 1 & 2 being played this Saturday and Groups 3 & 4 the following week. The top 2 teams in each of the groups go forward to the TSB Trophy with the remaining teams competing for the Reid Crescent Shield on the final week. For details of Group 1 & 2 click HERE and for Groups 3 & 4 click HERE. 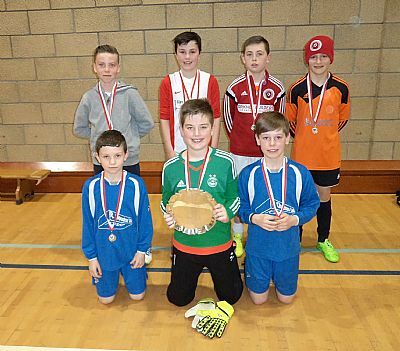 St Andrews Hurricanes and Hope Hotspurs took the honours as the Primary Indoor Football League was concluded at Picky on Saturday night in front of a large crowd of supporters. Needing to win two of their last four matches Hurricanes task was made easier when nearest challengers Real Dounby lost their opening match 2-1 to St Andrews Dynamos. 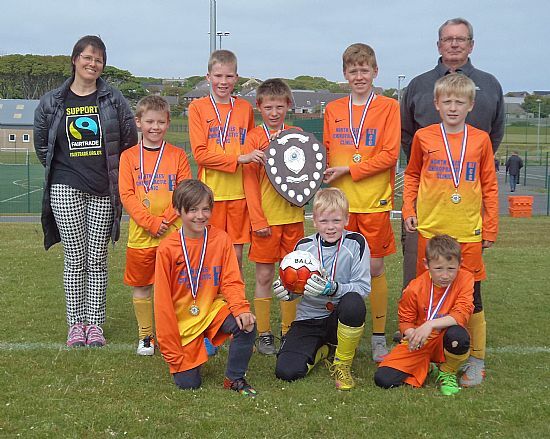 This left Hurricanes needing to win their first match against Stromness Predators to secure the league and Mount Cup for the first time in five years. Predators pushed Hurricanes all the way taking the lead in the match but a penalty and a late goal secured the necessary points for Hurricanes with three games to spare. This was a deserved victory for the St Andrews team who took over pole position at the start of January and have got stronger as the second half of the season progressed. Credit is due to Real Dounby who pushed Hurricanes all the way and in finishing second put in the best performance by a Dounby side since Inter Dounby finished runners up in 2002/03. In their final match of the league they faced up against Hurricanes and for the second time this season the match between the leading two sides ended in a 0-0 draw highlighting the fact that there is little to choose between the leading two clubs. Hope Hotspurs picked up the Shore Shield for the smaller primary schools after edging out Evie Hammers in a thrilling race which also went to the final night. Hammers edged into the lead as they won their opening two matches of the night whilst Hotspurs were beaten by Papdale Flyers in their first match. In their second match Hotspurs secured a valuable two points in a 1-1 draw with St Andrews Dynamos, whilst despite putting in a fine performance Evie lost their final match 1-0 against Flyers to hand the Hope a first victory in this competition since 2011/12 when a combined Hope/Burray side won the Shield. For supporters of Hotspurs and Evie this has been a thrilling competition that swung in favour of one team, then the other, on a weekly basis. Torpedos 0 Dynamos 2; Inter 5 Swans 0; Hammers 3 Marvels 0; Predators 3 Torpedos 0; Dynamos 1 Inter 0; Swans 0 Twisters 2; Marvels 3 Terriers 0; Dales 1 Inter 2; Real 1 Dynamos 2; Torpedos 0 Hammers 2; Swans 0 Marvels 2; Hotspurs 0 Flyers 5; Twisters 0 Dales 1; Inter 0 United 2; Predators 1 Hurricanes 2; Athletico 3 Rovers 0; Dynamos 1 Hotspurs 1; Terriers 0 Twisters 2; Real 5 Dales 0; Athletico 0 Kings 4; Terriers 0 Devils 3; Hammers 0 Flyers 1; Predators 0 Dales 0; Rovers 3 Terriers 0; United 1 Hurricanes 2; Scorpions 1 Hotspurs 2; Cyclones 0 Athletico 0; Real 4 Falcons 0; Twisters 0 Spurs 4; Hurricanes 5 Kings 0; Vikings 1 Devils 0; Flyers 1 Predators 1; Falcons 1 Rovers 1; Scorpions 0 United 3; Hurricanes 0 Real 0; Devils 1 Cyclones 1; Spurs 1 Vikings 0; Kings 5 Falcons 0; United 1 Flyers 1; Rovers 2 Scorpions 1; Spurs 1 Cyclones 1; Vikings 2 Falcons 1. 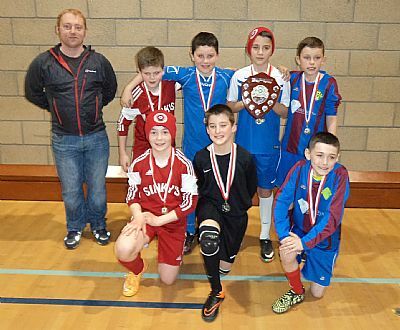 The penultimate week of the Primary Indoor League took place on Saturday at Picky. With a lengthened fixture list due to the record number of teams playing this year, there were a number of excellent performances. At the top of the League both St Andrews Hurricanes and Real Dounby won all of their matches and with only one week remaining, Hurricanes have one hand on the trophy maintaining their 10 point lead over the west team. The small schools competition will also be decided on the final night although Hope Hotspurs stretched their 3 point lead to 7 by winning all 4 of their games while Evie Hammers won 3 but lost narrowly to second place Real. Other notable performances came from Spurs and Dynamos who produced perhaps the game of the night, sharing the points in a 1-1 draw. Mighty Marvels, with only four players, showed great determination against in form Hotspurs, while Glaitness Swans’ goalie saved an early penalty against Hurricanes before the league leaders showed what a talented side they are. Rovers 0 Flyers 3; United 4 Cyclones 1; Falcons 0 Hotspurs 5; Predators 1 Spurs 1; Terriers 0 United 2; Falcons 0 Flyers 4; Cyclones 3 Scorpions 0; Rovers 1 Twisters 1; Vikings 0 Predators 3; Hotspurs 5 Swans 0; United 0 Dales 0; Spurs 2 Rovers 0; Terriers 0 Falcons 1; Flyers 5 Twisters 0; Scorpions 1 Predators 1; Swans 0 Vikings 2; Dales 5 Cyclones 0; Marvels 0 Hotspurs 5; Spurs 1 Dynamos 1; Twisters 1 Athletico 0; Devils 2 Scorpions 2; Swans 0 Hurricanes 5; Inter 2 Terriers 1; Dales 4 Torpedos 0; Vikings 1 Athletico 0; Cyclones 0 Hammers 2; Hotspurs 1 Torpedos 0; Kings 4 Marvels 0; Real 2 Hammers 1; Spurs 2 Torpedos 0; Kings 1 Dynamos 1; Scorpions 0 Real 2; Athletico 1 Swans 0; Devils 0 Kings 2; Hurricanes 5 Inter 0; Torpedos 0 Athletico 0; Marvels 2 Devils 0; Vikings 0 Hurricanes 4; Hammers 5 Kings 0; Dynamos 3 Marvels 0; Devils 0 Real 5; Inter 0 Hammers 2. St Andrews Hurricanes have established themselves as favourites for the Primary Indoor Football League with only two weeks of fixtures left to play. Hurricanes came through a difficult set of fixtures which included a 4-0 win over second placed St Andrews Dynamos and a 2-0 victory over Evie Hammers. Meanwhile their main challengers Real Dounby suffered their first defeat of the season on Saturday night losing against Papdale Flyers to fall ten points behind the league leaders. Flyers outplayed the Dounby side as they put in their best performance of the season to win 3-0. As well as Hurricanes and Flyers, Glaitness Spurs and Papdale Dales also picked up maximum points with Flyers moving up into third place above St Andrews Dynamos. Dales three victories included a good 1-0 win over Dynamos. The terrific race for the Shore Shield for the smaller schools is too close to call with Hope Hotspurs moving into a narrow three points advantage over Evie Hammers. Whilst Hammers lost difficult matches against Hurricanes and Real Dounby, Hotspurs won all three of their games. This included a fine 3-1 victory in a difficult match against Glaitness United. In a keenly fought match between two of the lower placed sides, Stromness Devils and Glaitness Swans could not be separated as they shared the points in a 1-1 draw. Predators 3 Inter 0; Swans 0 Spurs 2; Twisters 0 Kings 2; Scorpions 0 Hurricanes 5; Swans 1 Devils 1; Kings 1 Predators 1; Inter 2 Twisters 1; Marvels 0 Spurs 1; Scorpions 0 Athletico 0; Hurricanes 4 Dynamos 0; Hammers 4 Devils 0; Twisters 0 Cyclones 2; Dynamos 5 Swans 0; Rovers 0 Predators 2; Spurs 2 Kings 0; Marvels 0 Inter 5; Scorpions 0 Dales 2; Hurricanes 2 Hammers 0; Athletico 0 Hotspurs 2; United 5 Devils 0; Dales 1 Dynamos 0; Real 5 Marvels 0; Cyclones 3 Rovers 1; Athletico 0 Flyers 5; Hammers 1 Real 2; Dales 2 Terriers 0; Vikings 0 Hotspurs 3; Rovers 0 United 3; Flyers 5 Terriers 0; Vikings 0 Cyclones 0; Hotspurs 3 United 1; Flyers 3 Real 0; Terriers 0 Vikings 3. St Andrews Hurricanes and Real Dounby won all of their matches to continue their unbeaten runs in the Primary Indoor League at Picky on Saturday night with Hurricanes maintaining their 6 point lead at the top. Real avoided a further slip up against schoolmates Inter who held them to a 1-1 draw in their first meeting and it was another tight match with Real scoring the only goal of the match for a narrow victory. Evie Hammers also won all their matches to overtake Hope Hotspurs in the Shore Shield for the smaller primary schools. Hotspurs faced a difficult set of fixtures and dropped points when they lost to both Glaitness Spurs and Real and they now trail Evie by 5 points. Papdale Flyers and Glaitness Spurs were the only other sides to pick up maximum points on Saturday night. In the bottom half of the league Athletico Dounby picked up two wins which saw them move up three places in the league. United 1 Torpedos 0; Hammers 4 Rovers 0; Hurricanes 3 Dales 0; Flyers 5 Torpedos 0; United 1 Dynamos 1; Hammers 3 Falcons 0; Kings 1 Rovers 1; Torpedos 2 Twisters 1; Flyers 3 Scorpions 0; Rovers 0 Hurricanes 2; Kings 1 Dales 2; Athletico 1 United 4; Dynamos 5 Terriers 0; Hammers 3 Swans 0; Falcons 0 Hurricanes 5; Dynamos 4 Twisters 0; Kings 0 Flyers 1; Vikings 2 Scorpions 0; Dales 2 Marvels 1; Falcons 1 Inter 3; Terriers 1 Athletico 2; Real 5 Swans 0; Marvels 0 Cyclones 4; Twisters 0 Vikings 1; Spurs 2 Scorpions 0; Cyclones 0 Hotspurs 4; Marvels 0 Athletico 3; Terriers 0 Spurs 4; Hotspurs 0 Real 3; Inter 2 Vikings 1; Swans 0 Cyclones 3; Spurs 1 Hotspurs 0; Inter 0 Real 1. St Andrews Hurricanes and Real Dounby picked up maximum points in the Primary Indoor Football League on Saturday night to extend their lead at the top as third and fourth placed St Andrews Dynamos and Papdale Flyers dropped points. It was not plain sailing for the top sides however as Glaitness Spurs put up a good fight against Hurricanes before eventually falling to a 2-0 defeat and Real fell behind against St Andrews Cyclones before pulling through 3-1. Performance of the night was by third bottom Stenness/Orphir Falcons as they beat third top St Andrews Dynamos 1-0 for their best result of the season. It was a disappointing night for fourth placed Papdale Flyers as they only picked up a single point. 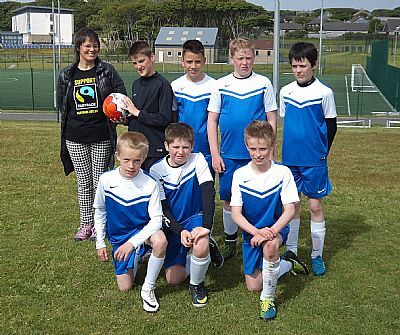 Stromness Predators moved up into fifth place winning all three of their games. It was also a good night for Glaitness United, Papdale Dales and Inter Dounby as all three sides picked up maximum points, with Inter completing a league double over Flyers. After playing their games in hand on Hope Hotspurs, Evie Hammers have reduced Hotspur’s lead in the Shore Shield to just three points. Cyclones 1 Real 3; Dynamos 2 Vikings 0; Hurricanes 5 Marvels 0; Spurs 4 Falcons 0; Real 5 Vikings 0; Flyers 0 Dynamos 1; Torpedos 0 Cyclones 1; Marvels 1 Falcons 0; Hurricanes 2 Spurs 0; Cyclones 0 Flyers 0; Real 5 Rovers 0; Falcons 1 Dynamos 0; Torpedos 3 Marvels 0; Vikings 0 Rovers 0; Devils 0 Hurricanes 5; Flyers 1 Inter 3; Scorpions 2 Torpedos 1; Hammers 0 Spurs 0; Rovers 0 Dales 1; Devils 0 Athletico 2; Predators 3 Twisters 0; Kings 3 United 4; Inter 4 Devils 1; Twisters 0 Scorpions 1; Swans 0 Kings 5; United 1 Hammers 0; Athletico 0 Dales 3; Swans 0 Predators 4; Inter 1 Kings 0; Twisters 2 United 5; Dales 4 Swans 0; Athletico 0 Predators 4; Scorpions 0 Hammers 2. There is no change at the top of the Primary Indoor Football League as leaders St Andrews Hurricanes and second placed Real Dounby won all of their matches at Picky on Saturday night. It was Real who faced the toughest test as they were pushed all the way by Glaitness Spurs before eventually securing a 2-0 win. Hurricanes lead at the top remains 6 points. Three other sides - St Andrews Dynamos, Papdale Flyers and Papdale Dales also picked up maximum points. With Evie Hammers having a week off Hope Hotspurs took full advantage in the race for the Shore Shield for the smaller primary schools. Although Hotspurs were held to a 1-1 in a closely fought match with Stromness Predators they won both their other matches to move up to fifth place and 8 points ahead of Evie. In the lower half of the league Steness/Orphir Falcons enjoyed their best week so far as they picked up two victories against higher placed opposition in Papdale Vikings and Stromness Devils. Bottom placed Hope Terriers also picked up a point in an exciting goalless draw against Glaitness Swans. A number of other exciting matches also ended up all square with Papdale Mighty Marvels drawing 2-2 with Firth Scorpions and 1-1 with St Andrews Twisters. Terriers 0 Hotspurs 5; United 5 Marvels 0; Inter 4 Athletico 0; Hotspurs 4 Scorpions 0; Swans 0 Terriers 0; Inter 0 Spurs 0; Athletico 0 Real 5; Marvels 2 Scorpions 2; United 4 Swans 0; Hotspurs 1 Predators 1; Real 5 Terriers 0; Swans 1 Scorpions 2; Rovers 0 Inter 3; Dynamos 5 Athletico 0; Real 2 Spurs 0; United 0 Predators 1; Marvels 1 Twisters 1; Rovers 0 Dynamos 2; Spurs 0 Flyers 2; Falcons 2 Vikings 1; Cyclones 0 Hurricanes 4; Predators 0 Flyers 3; Torpedos 0 Dales 2; Dynamos 4 Cyclones 0; Devils 1 Falcons 2; Vikings 0 Flyers 5; Hurricanes 4 Twisters 0; Torpedos 0 Rovers 0; Dales 4 Vikings 1; Twisters 1 Devils 0; Cyclones 3 Falcons 0; Hurricanes 3 Torpedos 0; Dales 3 Devils 1. St Andrews Hurricanes consolidated their position at the top of the Primary Indoor Football League as the latest set of fixtures was played at Picky on Saturday night. The Hurricanes were in fine form as they won all three of their matches including potentially tricky matches against Papdale Flyers and Hope Hotspurs. Meanwhile their nearest challengers Real Dounby opened up with a difficult match against St Andrews Dynamos and were unable to make their mark as the game ended goalless. More unexpectedly Real were then held to a 1-1 draw by schoolmates Inter in their second game as they dropped further valuable points. Hurricanes now hold a six point advantage in the league title race. Papdale Kings were the only other side to pick up maximum points on the night which included a good 2-0 win against Glaitness Spurs. In the bottom half of the league Glaitness Rovers and Papdale Mighty Marvels enjoyed their best week of the season with both sides enjoying a couple of victories. 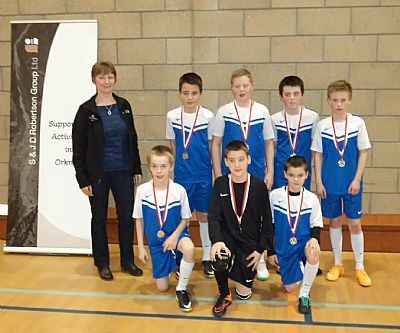 Stenness/Orphir Falcons were also pleased to pick up their second win in the league. There is still nothing to choose between the two leading sides in the race for the Shore Shield for the smaller primary schools. Only two points separate Evie Hammers and Hope Hotspurs as they matched each other on the night with both securing two victories. Flyers 1 Hammers 0; Dynamos 3 Predators 1; Twisters 5 Swans 1; Torpedos 0 Flyers 2; Predators 1 Cyclones 1; Twisters 0 Hammers 5; Dynamos 0 Real 0; Swans 0 Torpedos 2; Falcons 0 Kings 5; Hammers 3 Inter 1; Devils 0 Dynamos 5; Predators 0 Scorpions 0; Flyers 0 Hurricanes 4; Cyclones 0 Spurs 2; Hotspurs 5 Twisters 0; Falcons 1 Swans 0; Kings 4 Torpedos 0; Real 1 Inter 1; Devils 1 Marvels 3; Cyclones 5 Terriers 0; Hurricanes 2 United 0; Kings 2 Spurs 0; Athletico 0 Scorpions 3; United 5 Falcons 0; Rovers 4 Devils 1; Hurricanes 3 Hotspurs 0; Marvels 0 Real 5; Terriers 0 Inter 5; Hotspurs 4 Athletico 0; Scorpions 2 Rovers 1; Spurs 1 United 5; Terriers 0 Marvels 5; Rovers 1 Athletico 0. There was plenty of excitement as the Primary Indoor Football League resumed on Saturday night at Picky following the Christmas break. The night ended with new league leaders as St Andrews Hurricanes took over top spot from Real Dounby who had led the league since the opening weeks. It was Stromness Predators who disrupted the Dounby bandwagon as they held Real to a goalless draw in their opening match of the year. In a tight match with few chances created Stromness fully deserved a share of the points. With Hurricanes winning all their matches on the night they now move into a narrow single point lead over Real at the top of the league. Another St Andrews team, Dynamos have now moved into third place in the league. This was despite suffering only their second defeat of the season in a 1-0 loss against Glaitness Spurs. It was a good night for Spurs who along with Hurricanes were the only team to win all three of their matches, and for Predators who as well as holding the leaders to a draw, also beat high flying Evie Hammers by a single goal. With Evie dropping points and Hope Hotspurs picking up a couple of victories the race for the Shore Shield for the smaller primary schools has intensified. Evie now only hold a two point advantage over the Hope side. There were many close matches on the night resulting in nearly all the teams picking up points and amongst the lower placed teams there were good victories for Athletico Dounby and Glaitness Rovers. Predators 4 Swans 0; Terriers 0 Kings 3; Devils 0 Hotspurs 4; Predators 0 Real 0; Hurricanes 5 Swans 0; Terriers 0 Rovers 5; Kings 1 Athletico 2; Falcons 0 Real 4; Devils 1 Vikings 1; Rovers 0 Hotspurs 1; Kings 0 Hurricanes 5; Torpedos 3 Terriers 0; Predators 1 Hammers 0; Twisters 1 Rovers 1; Vikings 1 Swans 1; Hotspurs 0 Dynamos 2; Athletico 0 Falcons 0; Devils 0 United 5; Dales 0 Real 3; Inter 0 Hurricanes 4; Dynamos 3 Hammers 1; Torpedos 0 Spurs 1; Falcons 0 Scorpions 5; Athletico 0 Twisters 0; Vikings 1 Spurs 2; Cyclones 0 United 4; Dales 2 Scorpions 0; Torpedos 0 Inter 2; Hammers 1 Cyclones 1; Dales 4 Twisters 1; Dynamos 0 Spurs 1; Scorpions 2 Cyclones 2; United 1 Inter 1. There was plenty of excitement at Picky on Saturday night as a large crowd gathered for the final set of fixtures before the Christmas break. The table topping clash between league leaders Real Dounby and second placed St Andrews Hurricanes was eagerly anticipated with both sides looking for a win to establish an advantage in what is becoming a very tight league race. In a tense match for supporters of both sides, it was perhaps surprising that neither team were able to score and the game ended in an honourable draw. Hurricanes created the better of the chances but Dounby defended very well with their keeper pulling off a string of excellent saves. Earlier in the evening both sides had maintained their unbeaten records with Real being made to fight all the way in a narrow 1-0 win over Glaitness United and Hurricanes ending St Andrews Dynamos unbeaten record after Dynamos had given them a fright by taking an early lead in a match that raged from end to end. With Hurricanes dropping points Papdale Flyers who won all their matches moved into second place one point behind Real although the Papdale side have played three more games than the other challengers. It was also a good night for Glaitness Spurs and St Andrews Cyclones who picked up maximum points. Hope Hotspurs ensured that they remain in contention for the Shore Shield for the smaller primary schools when they beat leading challengers Evie Hammers by a single goal. There were good performances by the lower placed teams with St Andrews Twisters, Glaitness Swans and Stenness/Orphir Falcons all picking up points. Orphir Torpedos also enjoyed a very good 1-0 victory against Stromness Predators with a goal in the last seconds of the match. The league resumes on Saturday 9 January 2016 after the Christmas break. Marvels 1 Vikings 2; Dales 0 Flyers 2; Hotspurs 1 Hammers 0; United 3 Rovers 0; Devils 3 Terriers 0; Hammers 2 Dales 0; Kings 4 Vikings 0; Marvels 0 Dynamos 5; Flyers 4 Rovers 1; Hotspurs 2 Kings 0; Dales 0 United 3; Torpedos 5 Devils 1; Terriers 0 Hammers 3; Predators 3 Hotspurs 1; Flyers 3 Athletico 0; Rovers 0 Cyclones 2; Vikings 3 Marvels 0; Torpedos 1 Predators 0; Dynamos 1 Hurricanes 2; Cyclones 2 Kings 1; Falcons 0 Devils 0; Real 1 United 0; Spurs 5 Twisters 0; Terriers 0 Hurricanes 5; Swans 0 Dynamos 4; Athletico 0 Spurs 4; Falcons 0 Predators 2; Real 4 Torpedos 0; Cyclones 3 Twisters 1; Swans 1 Athletico 1; Real 0 Hurricanes 0; Twisters 2 Falcons 0; Spurs 4 Swans 0. Spurs 4 Devils 0; Inter 5 Rovers 1; United 2 Scorpions 0; Devils 0 Hammers 4; Dales 3 Spurs 3; Scorpions 0 Inter 2; Rovers 0 Hammers 2; Vikings 0 United 4; Devils 0 Predators 5; Scorpions 0 Spurs 3; Rovers 0 Falcons 0; Swans 0 Inter 2; Dynamos 1 Dales 1; Flyers 2 United 0; Hammers 0 Hurricanes 2; Cyclones 4 Vikings 0; Predators 5 Terriers 0; Falcons 0 Torpedos 2; Hurricanes 5 Vikings 0; Marvels 4 Swans 1; Cyclones 3 Dales 0; Dynamos 5 Kings 2; Twisters 0 Flyers 5; Hurricanes 3 Predators 0; Falcons 1 Terriers 0; Hotspurs 3 Cyclones 0; Kings 4 Twisters 0; Flyers 5 Marvels 0; Swans 0 Hotspurs 5; Dynamos 3 Torpedos 0; Marvels 2 Kings 2; Twisters 1 Terriers 1; Torpedos 0 Hotspurs 2. There was plenty of excitement at the top and bottom of the Primary Indoor League as the latest set of fixtures were played at Picky. With league leaders Real Dounby having a week off the chasing pack took full advantage and Real’s lead at the top has now been cut with Evie Hammers and St Andrews Hurricanes now in joint second place only two points behind the West Mainland school. In the top match Evie suffered their first defeat of the season when they lost 2-0 to Hurricanes. An early goal settled Hurricane nerves and despite the best efforts of Evie the St Andrews team were able to add a second to record a crucial victory. As well as Hurricanes, Padale Flyers, Hope Hotspurs, and Inter Dounby also won all their matches and St Andrews Dynamos continued their excellent start as they retained their unbeaten record in the league. There was delight for the bottom two sides as Stenness/Orphir Falcons picked up their first points drawing with Glaitness Rovers and then beating Hope Terriers by a single goal. Terriers then produced their best result so far when they drew 1-1 with St Andrews Twisters. Other memorable matches on the night saw Papdale Dales scoring a late equaliser in drawing 3-3 with Glaitness Spurs and Papdale Mighty Marvels doing likewise as they came back from 2-0 down for an excellent draw against Papdale Kings. 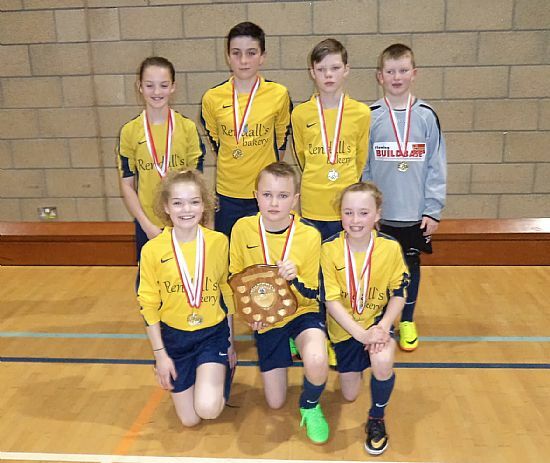 There was no change at the top of the Primary Indoor Football League as the three leading clubs - Real Dounby, Evie Hammers and St Andrews Hurricanes won all their matches comfortably with Real maintaining their ten point advantage. Papdale Flyers and St Andrews Dynamos who also enjoyed three victories moved up into fourth and fifth positions. Despite leading 2-0 Orphir Torpedos were edged out 4-3 by Papdale Vikings in one of the most exciting matches of the night. This turned out to be the best night of the season for Vikings who picked up maximum points to move them five places up the league. Hurricanes 5 Falcons 0; Twisters 1 Torpedos 1; Athletico 0 Cyclones 5; Inter 0 Dynamos 2; Hotspurs 5 Falcons 0; Athletico 0 Hurricanes 5; Vikings 1 Twisters 0; Hammers 4 Torpedos 1; Inter 2 Cyclones 1; Scorpions 1 Dynamos 4; Falcons 0 Dales 4; Hotspurs 3 Inter 1; Hammers 4 Athletico 0; Dales 0 Hurricanes 3; Torpedos 3 Vikings 4; Real 4 Twisters 0; Cyclones 2 Devils 2; Terriers 0 Dynamos 4; Flyers 3 Hotspurs 0; Marvels 0 Hammers 4; Terriers 0 Scorpions 5; Dales 2 Predators 3; Kings 0 Real 5; Vikings 3 Terriers 0; Scorpions 3 Swans 0; Marvels 0 Rovers 0; Kings 5 Devils 0; Flyers 5 Swans 0; Rovers 0 Real 5; Predators 5 Marvels 0; Devils 0 Flyers 5; Swans 0 Rovers 1; Predators 0 Kings 2. West Mainland sides Real Dounby and Evie Hammers picked up maximum points on Saturday night to maintain their positions at the top of the Primary Indoor Football League. Both teams had fairly comfortable victories although Real were made to work hard for their 2-0 win against St Andrews Cyclones. Moving into third place with games in hand on the leaders are St Andrews Hurricanes who also won all their matches. With Evie making such an excellent start to the league the other smaller schools have been struggling to keep up with the pacesetters in the Shore Shield but Hope Hotspurs remain in touch after clocking up another three wins. Also picking up full points were St Andrews Dynamos who retain their unbeaten start to the league, and Glaitness United. In the lower reaches of the league St Andrews Twisters enjoyed their second victory of the season to move four places up the table. Papdale Kings and Orphir Torpedos served up the most exciting match of the night with Kings scoring the winner in the last seconds of an exciting seven goal thriller. Athletico 0 Torpedos 2; Inter 3 Falcons 0; Real 5 Devils 0; Dales 4 Athletico 0; Torpedos 3 Kings 4; Falcons 0 Hammers 5; Vikings 0 Inter 3; Devils 0 Dales 5; Cyclones 4 Torpedos 0; Vikings 0 Real 4; Athletico 0 Dynamos 3; Hammers 4 Scorpions 0; Twisters 1 Inter 0; Real 2 Cyclones 0; Kings 3 Scorpions 1; Dynamos 5 Falcons 0; Hurricanes 5 Devils 0; Hotspurs 3 Dales 1; Predators 5 Vikings 1; Hammers 5 Terriers 0; Kings 0 Hotspurs 4; Twisters 1 Predators 4; Hurricanes 5 Scorpions 0; Cyclones 2 Marvels 1; United 5 Twisters 0; Dynamos 4 Flyers 1; Spurs 0 Hurricanes 3; Marvels 0 United 5; Terriers 0 Flyers 5; Spurs 0 Predators 0; Hotspurs 4 Marvels 0; Terriers 0 United 5; Flyers 3 Spurs 0. Real Dounby continued their perfect start to the Primary Indoor League with a further three victories on Saturday night at Picky to increase their lead at the top to ten points. Despite facing difficult opponents they overcame Hotspurs 2-0 and Predators 3-0 to establish themselves as genuine title challengers. Evie have also made an impressive start to the league and in winning all three of their matches they remain unbeaten and move into second place with Glaitness Spurs who they beat 2-0 on the night. St Andrews Hurricanes returned to action after a week off and they picked up full points as did Glaitness United with both sides moving up the league table. Evie’s excellent start has seen them race into the lead in the Shore Shield for the smaller primary schools and they now lead Hope Hotspurs and Firth Scorpions by 8 points. It was a good night for Scorpions with 2 wins and a draw. Towards the bottom of the league Stromness Devils enjoyed their best week so far as they picked up a first victory against Glaitness Swans, with a further two draws seeing them more than double their points tally. Real 2 Hotspurs 0; Terriers 0 Dales 3; Inter 1 Torpedos 0; Hotspurs 5 Vikings 0; Real 3 Predators 0; Athletico 2 Terriers 0; United 3 Hotspurs 0; Inter 1 Predators 3; Spurs 5 Terriers 0; Swans 0 Dales 4; United 4 Torpedos 0; Scorpions 3 Falcons 0; Hammers 4 Vikings 0; Athletico 1 Devils 1; Twisters 0 Real 5; Predators 2 Rovers 0; Falcons 1 Spurs 2; Kings 2 Inter 2; Flyers 3 Dales 1; Swans 0 Hammers 5; Marvels 0 Torpedos 2; United 4 Kings 0; Rovers 0 Vikings 3; Scorpions 1 Devils 1; Hurricanes 4 Athletico 0; Spurs 0 Hammers 2; Scorpions 5 Twisters 0; Marvels 0 Hurricanes 5; Devils 5 Swans 0; Flyers 5 Falcons 0; Twisters 1 Marvels 3; Rovers 1 Kings 4; Hurricanes 3 Flyers 0. Real Dounby have moved 5 points clear at the top of the Primary Indoor Football League. After winning all their three matches on Saturday comfortably they remain as the only team with a 100% record after the opening nine matches. St Andrews Dynamos in second place remain unbeaten but dropped points when they were held to draws by Evie and Firth Scorpions. Two other teams Papdale Flyers and Stromness Predators picked up maximum points in winning all their games. It was also a good night for Glaitness Spurs who moved up into third place and an unbeaten night for Firth Scorpions saw them climb a number of places into the top half of the league. Evie Hammers and Hope Hotspurs are the early pace setters in the Shore Shield for the smaller primary schools. Hammers continued their unbeaten start to the league and sit level on points with Hotspurs. Evie did well to hold Dynamos to a 0-0 draw with Hotspurs having an equally good 1-1 draw with Spurs. Towards the bottom end of the league Papdale sides Mighty Marvels and Vikings picked up their first victories of the season, whilst the Hope Terriers were delighted to pick up their first point in a 0-0 draw with Glaitness Swans. Possibly the most impressive performance of the night was by the diminutive but pacy St Andrews Cyclones who convincingly beat Papdale Kings 5-0. Real 5 Kings 1; Scorpions 5 Terriers 0; Dales 5 Falcons 2; Kings 5 Swans 0; Torpedos 1 Scorpions 2; Dales 3 Rovers 0; Inter 1 Hotspurs 5; Terriers 0 Swans 0; Torpedos 1 Real 5; Falcons 1 Athletico 2; Kings 0 Cyclones 5; Terriers 0 Real 5; Dynamos 2 Scorpions 2; Swans 0 Flyers 5; Vikings 1 Torpedos 0; Devils 0 Inter 3; Hotspurs 4 Rovers 0; Spurs 2 Dales 0; Falcons 0 Marvels 2; Predators 5 Athletico 0; United 3 Vikings 0; Hammers 0 Dynamos 0; Cyclones 3 Inter 1; Flyers 5 Devils 0; Hotspurs 1 Spurs 1; Rovers 0 Marvels 0; Predators 4 United 1; Athletico 0 Hammers 4; Flyers 2 Cyclones 1; Vikings 0 Dynamos 4; Devils 0 Spurs 3; Marvels 0 Predators 4; Hammers 2 United 0. After the second week of the Primary Indoor Football League only two teams – Real Dounby and St Andrews Dynamos have picked up maximum points. On another exciting evening of action there were a number of surprise results with teams still trying to find their feet in the early stages of the season. The best result from the leading two clubs was achieved by Real who emerged 1-0 winners against Papdale Flyers. One of the best performances of the evening came from Hope Hotspurs who held the much fancied St Andrews Hurricanes to a 1-1 draw. It was a perfect night for Glaitness Spurs, Papdale Dales and St Andrews Cyclones who won all three of their matches. A good night for the Dounby teams also saw Inter Dounby beat Papdale Flyers by a single goal and Athletico Dounby pick up their first victories of the season against Papdale sides Viking and Mighty Marvels. Evie Hammers and Hope Hotspurs are the early pace setters in the Shore Shield for the smaller primary schools with Hammers continuing their unbeaten start to the league to lead Hotspurs by a single point. Scorpions 3 Vikings 1; Marvels 0 Dales 4; Flyers 4 Kings 0; Real 4 Scorpions 2; Athletico 2 Marvels 1; Inter 1 Flyers 0; Vikings 0 Hammers 2; Scorpions 0 Kings 2; Terriers 0 Torpedos 1; Dales 2 Hotspurs 1; Athletico 2 Vikings 0; Real 1 Flyers 0; Spurs 3 Marvels 1; Inter 0 Dales 2; Kings 5 Terriers 0; Swans 0 Real 5; United 5 Athletico 0; Hammers 0 Predators 0; Torpedos 4 Swans 0; Spurs 3 Inter 0; Hotspurs 1 Hurricanes 1; Terriers 0 Cyclones 5; Hammers 1 Twisters 0; Hotspurs 5 Devils 1; Dynamos 3 United 0; Rovers 0 Spurs 4; Predators 2 Falcons 0; Torpedos 0 Hurricanes 5; Cyclones 2 Swans 0; Devils 1 Rovers 1; Falcons 1 United 4; Predators 0 Dynamos 3; Devils 1 Twisters 1; Falcons 0 Cyclones 5; Hurricanes 5 Rovers 0; Twisters 0 Dynamos 2. 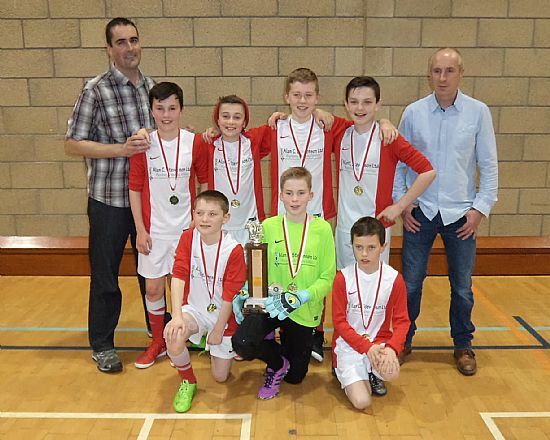 There was an exciting start to the 2015/16 Primary Indoor Football league at a noisy and well supported season opener at Picky on Saturday 31 October with plenty of close matches, late goals and great comebacks. It was an impressive start by St Andrews Hurricanes who look like they might be the team to beat this year as they won all three of their matches without any difficulty. Glaitness United looking to secure the Mount Cup for the third year in a row struggled on the first night losing two of their opening matches against Glaitness Spurs and Real Dounby. Three other teams – St Andrews Dynamos, Real Dounby and Papdale Flyers join Hurricanes in setting the early pace also winning all their matches. Amongst the smaller schools two of the contenders for the Shore Shield Evie Hammers and Hope Hotspurs drew 1-1 in a close match as both sides made an unbeaten start to the league. Evie also showed tremendous spirit in their match against Papdale Kings coming back from three goals down to earn a well deserved draw in the comeback of the night. Twisters 0 Hurricanes 5; Cyclones 1 Dynamos 4; Rovers 1 Swans 1; United 0 Spurs 1; Real 3 Athletico 0; Hurricanes 5 Cyclones 0; Dynamos 4 Rovers 0; Swans 0 United 5; Twisters 0 Hotspurs 5; Athletico 3 Inter 4; Spurs 1 Real 2; Hurricanes 5 Terriers 0; Cyclones 1 Predators 1; Dynamos 3 Devils 0; Falcons 1 Twisters 4; Rovers 3 Torpedos 2; United 0 Real 3; Swans 1 Falcons 0; Spurs 5 Athletico 0; Hammers 1 Hotspurs 1; Inter 1 Scorpions 1; Terriers 0 Predators 5; Devils 2 Torpedos 2; Marvels 0 Flyers 5; Hotspurs 3 Terriers 0; Vikings 0 Dales 1; Inter 4 Marvels 0; Kings 3 Hammers 3; Torpedos 3 Falcons 0; Scorpions 0 Flyers 2; Predators 3 Devils 0; Dales 4 Kings 2; Flyers 4 Vikings 0; Scorpions 3 Marvels 0; Dales 0 Hammers 3; Vikings 1 Kings 4. The Primary Indoor Football League commences this Saturday afternoon (31st October) with a 4pm kick off at Picky. This is a competition which is now in its 29th year and is thoroughly enjoyed by players and coaches, and is hugely popular and well supported by parents. This year there are a record 24 teams taking part, which is one more than last year. This includes additional teams from Glaitness – the Swans, and a second Hope/Burray side - the Terriers; a Stenness Falcons team instead of the combined Stenness/Orphir team, but only one team from Firth – Firth Scorpions. All teams are playing on the opening week with the opening match being a St Andrews derby between Twisters and Hurricanes. Glaitness United will be looking to secure the premier Mount Cup for the third year in a row after last year’s exciting league race which went to final match with both St Andrews Hurricanes and Papdale Flyers pushing the Glaitness side all the way. It is likely that these three sides will again be leading contenders in this year’s competition. The Shore Shield for the smaller primary schools is always difficult to call with four different schools winning in the last 5 years. Firth Scorpions were last year’s winners for the first time in 15 years after another tight contest with Hope/Burray Hotspurs, and both these sides along with Evie are likely to be pushing for honours this winter. For a full list of fixtures for the firsat half of the season (October-December) please click HERE.